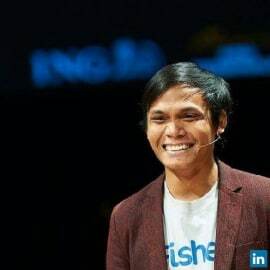 Gibran is the CEO and co-founder of eFishery, startup that provides smart technology for fish and shrimp farming business. eFishery is now recognized as one of the most distinguished IoT startups in Indonesia as well as disruptive startup in agriculture industry, as it is focusing in the big issue and creating impacts for both people and environment. It offers huge and direct impact for the fish and shrimp farms and builds a platform for all stakeholders in the industry.